July 17, 2012 by Anthony Palombo, D.C.
Our bodies are musical instruments . . . literally. Oh, we can’t hear the music they play. That would be weird and fun at the same time. But the body expresses its music through function, healthy function being harmonious music and dysfunction dissonant noise. Where there’s illness and noisy dissonance, harmonious sound and music can help bring harmony back to the functions of the body’s ill parts. Over the years, working with the endocrine glands in attunement and balancing their energy fields with those of the chakras, I’ve been able to chart their musical pitches. Initially, I worked only with the seven endocrine glands. I would “hear” the pitches with my inner ear and “feel” the urge to sound them in my vocal apparatus. For example, as I would hold a contact over the Pineal gland atop the cranium, I would feel the urge to sound a tone, thereby making the inaudible tone audible. That tone, during those early years in the 1970’s, was invariably an F natural pitch. Interestingly enough, the pitch changed toward the latter part of the 80’s to an F sharp (F#), half a pitch higher. I attributed that change to a shift to a higher frequency occurring globally as our solar system moves into a higher intensity energy field permeating the Milky Way Galaxy (see my other blog, healingtones.org). The Pineal gland was being renewed as it opened to the vibration of Love. I noticed this shift in the Pineal pitch particularly strong in individuals who were moving in a spiritual path toward personal transformation. Later on, as I began to include the seven chakras in my attunement work, the musical pitches generally associated with them were not the same as those I had assigned to the endocrine glands. For example, the pitch B natural was commonly assigned to the Crown Chakra in most of the literature. That puzzled me for quite a few years, until one evening, while pondering this discrepancy in preparation for a workshop I was going to conduct in California at an Attunement Guild Gathering, the resolution popped into my head. Their pitches are not supposed to be the same. Rather they form the harmonious duet of a perfect fifth: Do . . . Sol, an interval I’ve always called “the healing fifth” for some reason, a reason I was soon to discover. These 12 images are cymatic images produced by the vibrational frequency of each note. To better understand cymatics, I’ve embeded this short video clip of Evan Grant’s work with cymatics for your enjoyment. I’m very glad to see that Evan Grant and others are exploring and expanding interest in this fascinating field of cymatics. Now, to the heart of my work with what I call “Attunement with Sacred Sound.” It’s really quite simple. There are seven sacred energy centers in and around the body and there are seven notes in the octave of music, eight with the octave. I simply assigned one of these notes to each energy center, starting with F# at the top for the Pineal gland, the 7th level. 7. Now, as I said earlier, F# is the fifth harmonic of the B Major chord (B, D#, F#), D# being the third harmonic. 6. Coming down to the next endocrine center, the Pituitary gland, and the Brow Chakra at the 6th level, and to A natural, the next note below B natural, we have the A Major chord (A, C#, E). 5. Coming down to the 5th level of the Thyroid gland and the Throat Chakra, again working backwards down the scale, we have the G Major chord (G, B, D). 4, At the 4th level of the Thymus gland and Heart Chakra, we have the F Major chord (F, A, C). 3. At the 3rd level of the Pancreas and Solar Plexus, we have the E Major chord (E, G#, B). 2. At the 2nd level of the Adrenal glands, Naval Plexus and Root Chakra, we have the D Major chord (D, F#, A). 1. Finally, at the 1st level of the Gonads and the Sacral Plexus, we have the C Major chord (C, E, G). Now, the third harmonic—mi in the musical scale of do-re-mi-fa-sol-la-ti-do— represents the physical body sandwiched in between and embraced by these two sacred energy systems, and “played” by them, if you will, like strings on a violin or harp. Well, actually, it’s the incarnate angel who is playing his or her harp, and the music is the expression of life through the human capacity, which is supposed to be heavenly music. Only the instrument gets out of tune and so the music begins to sound off key and sour. Here’s where attunement with harmonious sound—or attunement alone without sound—comes in useful: to tune our harps to the harmonious music of Love’s sweet strains. I use sound in my attunement work to create a carrier wave for the healing current that has its origin in Spirit. I’ve found quartz crystal bowls to be the most natural sound-producing tools to use with energy work. They produce a sound wave that resonates naturally in the chords of the human voice. I have a few quartz bowls and also several Tibetan bowls and tuning forks which I use to generate pure sounds. I also use a couple of music CD’s. One particular CD that I find quite useful is Chords Of The Cosmos by Deborah Van Dyke in the Vancouver area (Sound Current Music, 602-222-0060. Order on the web at http://www.soundcurrent.net). She has recorded 12 five-minute tracks playing “Harmonies of the Zodiac with Crystal Bowls.” I use eight of these tracks during a 45-minute attunement session. I simply ripped and burned them onto another disc. The first track is the Libra track for balancing the body’s flow of energy at the crossover point in the upper cervical spine just below the cranium. It’s the F# Major chord (F# A# C#). I repeat this track at the end, so there are 9 tracks altogether, seven for the seven sacred energy sites and this one at the beginning of the session for balancing and repeated at the end of the attunement, again for balancing and to assist in lifting the energy upward in the ascending current. The harmonies of the F# chord tend to ascend toward heaven and before the throne of God in the body temple, the Pineal. 1. Aries (C E G) for Gonads and Sacral Plexus. Another CD is The Ultimate OM by Jonathan Goldman (Spirit Music Inc., P.O. Box 2240, Boulder CO 80306). You can order it online at http://www.healingsounds.com or by telephone (303) 443-8181. This is an hour-long recording of OM toned to a C Major drone interspersed with high frequency overtone harmonics that provide an excellent musical carrier wave for moving healing energy. His Divine Name CD is also an hour-long mantra chant of the Hebrew name of God, Yaweh, toned to a D Major drone with ascending overtone harmonics. Quite profound. These last two CD’s are great for meditation. When we consider that the endocrine glands produce crystals of hormones that carry information to all the cells in the body temple, it’s easy to understand how music, as well as light, play important roles in the missions of these hormonal “emissaries of light.” Not only is their chemistry produced by vibrations, these hormonal crystals carry “healing tones” to the body cells directing them in their highly coordinated community activities. The score of this music is the living manifestation of love in action. 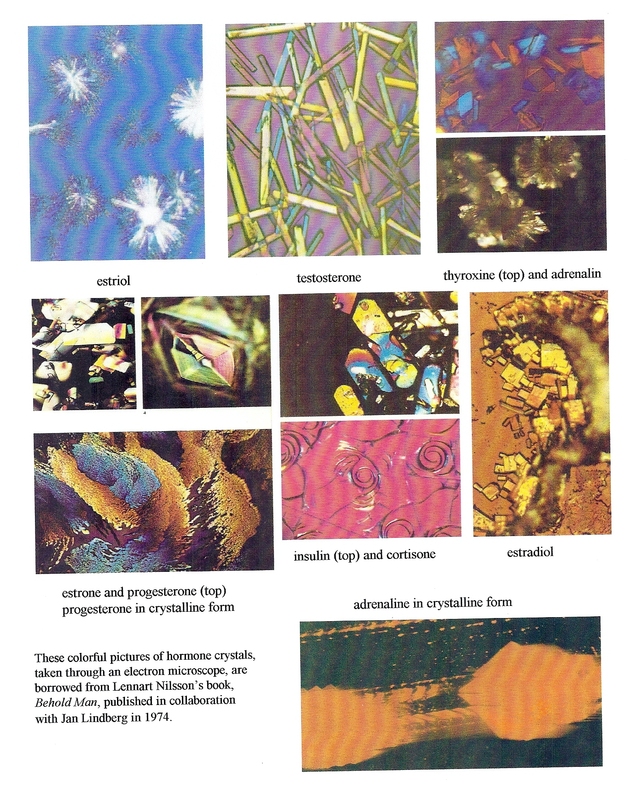 Each hormone is designed to convey a unique tone and color frequency. Altogether they “perform” a grand symphony of musical tones, overtones and undertones. The result ideally is health and vitality for the body temple, and graceful, balanced movement for the angel incarnate. Where the problem arises in human experience that produces dis-harmony and disease is when the human ego takes the harp out of the hands of the angel and starts playing its own “music,” which is not always heavenly. The harp soon looses its tuning. We may seek help in tuning up our harps, but ultimately it’s the music that I play on my own harp that keeps it in tune — or causes it to lose its tone. As angels, we are innately capable of playing beautiful music on our harps, and thereby keep them tuned to the sweet music of love. Visit my Healing Tones blog for an an exciting book review of Hugh Malafry’s latest novel, The Light at Lindisfarne. The theme of the post is the search for the Holy Grail of free energy. Enjoy! There are now 60 countries visiting my blogs. ALBANIA, ARGENTINA, AUSTRALIA, AUSTRIA, BANGLADESH, BARBADOS,BRAZIL, BULGARIA, CANADA, COLOMBIA, CROATIA, CZECH REPUBLIC, ECUADOR, EGYPT, FINLAND, FRANCE, GEORGIA, GERMANY, GREECE, HONG KONG, HUNGARY, ICELAND, INDIA, INDONESIA, IRELAND, ISRAEL, ITALY, JAMAICA, JAPAN, KUWAIT, MEXICO, MALAYSIA, NETHERLANDS, NEW ZEALAND, NORWAY, PAKISTAN, PERU, PHILLIPPINES, PORTUGAL, PUERTO RICO, ROMANIA, RUSSIAN FEDERATION, SPAIN, SINGAPORE, SLOVAKIA, SLOVENIA, SOUTH AFRICA, SOUTH KOREA, SWEDEN, SWITZERLAND, TAIWAN, THAILAND, TRINIDAD AND TOBAGO, TURKEY, UNITED ARAB EMIRATES, UNITED KINGDOM, USA, VENEZUELA, ZIMBABWE.